That’s what our teen daughter said a few days after we finished this gorgeous “DIY Wood Planked Wall”and I don’t blame her one bit. If I would have known how easy this was, I would have done it years ago. 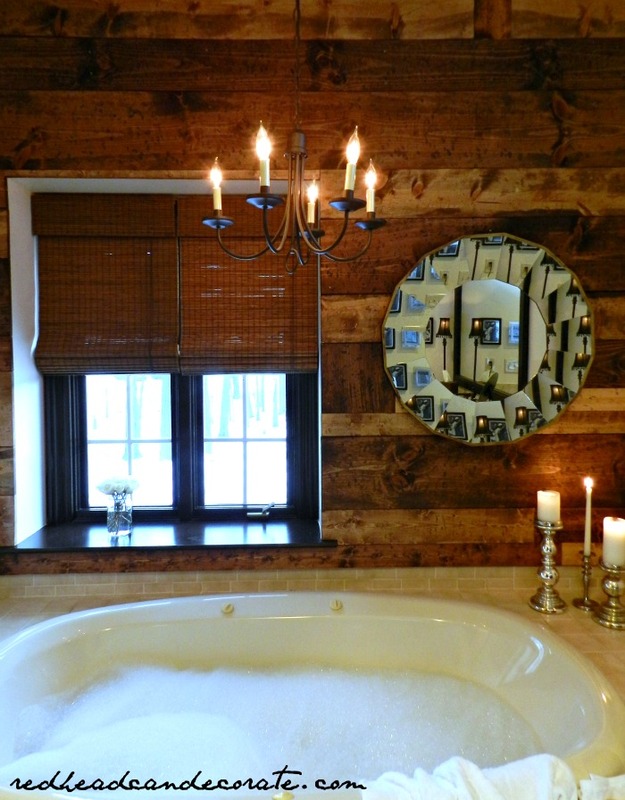 The wood adds charm, warmth, and coziness and it makes me feel as though I am in a fancy cabin in the woods and my horse drawn carriage is waiting for me outside. Okay…maybe I’m exaggerating a little, but what a huge transformation this is. The best part, it only cost us about $150.00 and was finished in one weekend. 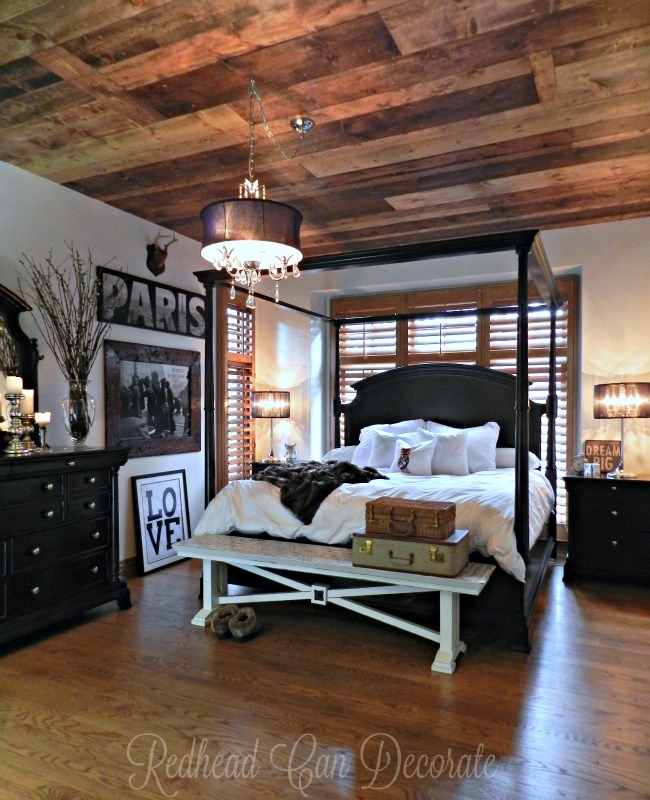 To achieve this look, we used the exact same process we used for the “DIY Wood Planked Ceiling“(full tutorial is included there). The only difference here, is that we nailed the nails in by hand. This took some strength, but it was easier than using a nail gun (using a nail gun on the ceiling is crucial in our personal opinion). We didn’t have gravity working so hard against us here. In fact, if you start at the bottom, which we did, you would have gravity working with you by resting the boards on each other while nailing them in. I also should mention, that we had to remove the molding that was under our window previously. Everything else remained, including the ceramic tile. Also, if you have worries about water damage, make sure you seal your wood like we did. If you’re searching for some beautiful rustic nails to use, you can find them here. Let me know your thoughts. I hope you try this one day. I plan on dressing it up for Valentine’s Day, so stop back over to check it out. We got a little creative with some of the extra wood. Sorry, gotta run, my bath is ready. 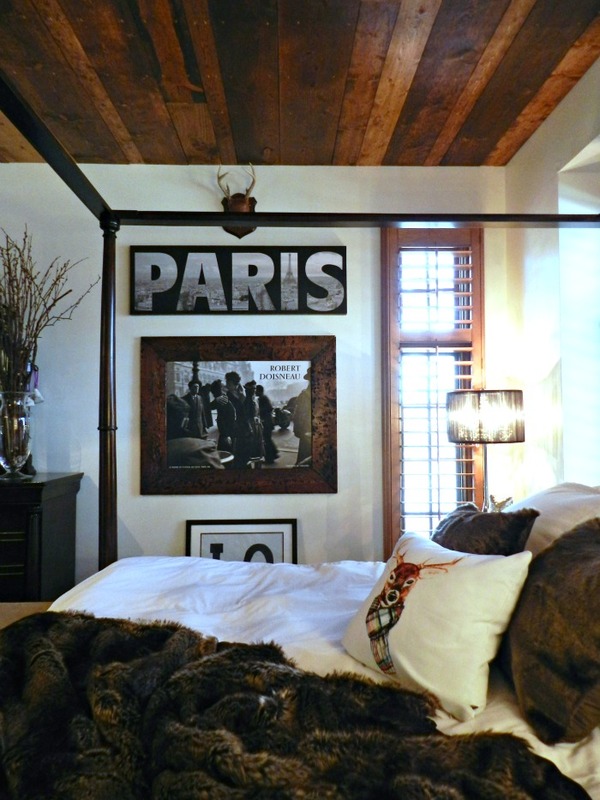 Your home is filled with so much charm Julie!!! 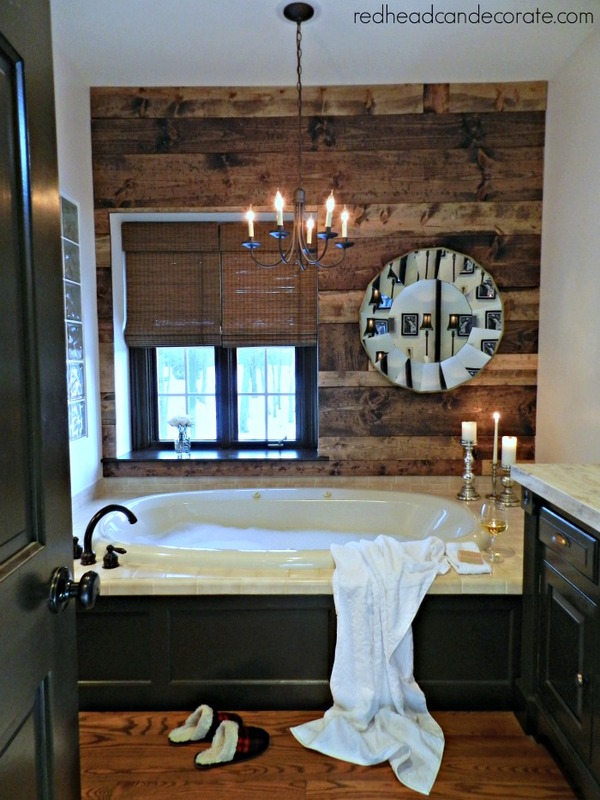 I love these wood walls..We’ve got this same style barn wood planked wall in my husband’s bath..now to get that tub of yours hahaha! So gorgeous ! Happy Friday!!!! It’s absolutely beautiful Julie. 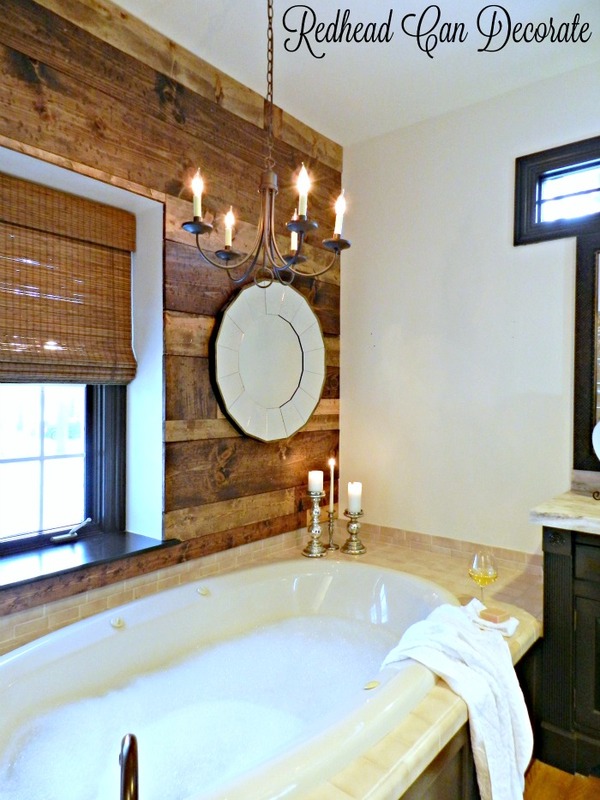 Looks so warm and cozy!I love a good bubble bath myself. Nice job Rick. I love this. Looks really beautiful. Love the design! My bath needs updating. Looks fabulous! Nicely done! Love the rich warm tones. what are your bathroom dimensions if you don’t mind me asking? 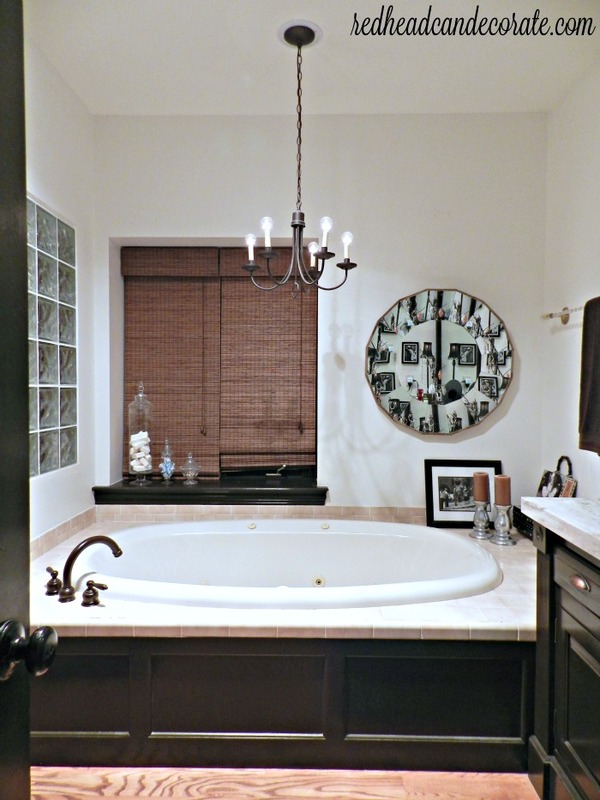 I love, love this bathroom. I’d like to duplicate it, totally. 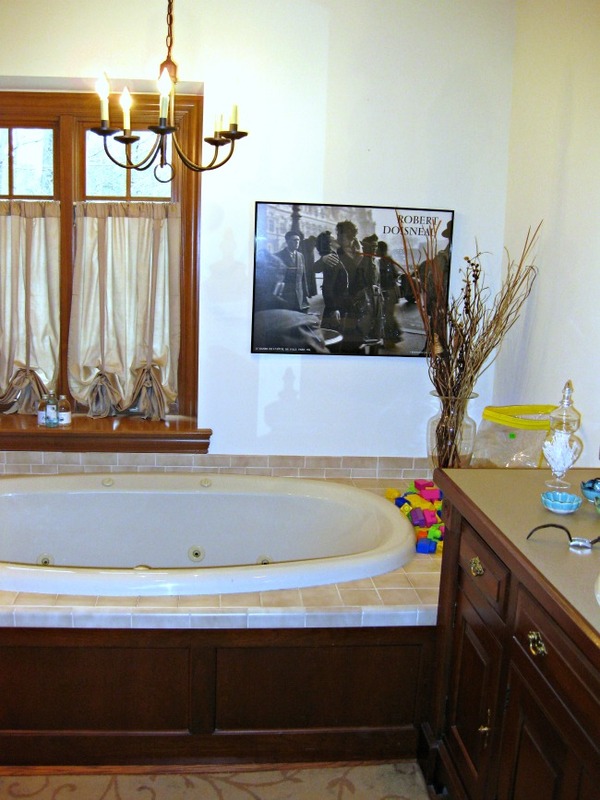 What color stain did you use for the vanity and trim? Was it stain or chalk paint. Details please. It was dark brown paint called expresso, Allison. I think it was Bear Ultra from Home Depot. I love all three, but the kitchen one is the best. Hi Deborah! How exciting…can you send me pics? What wonderful ideas. 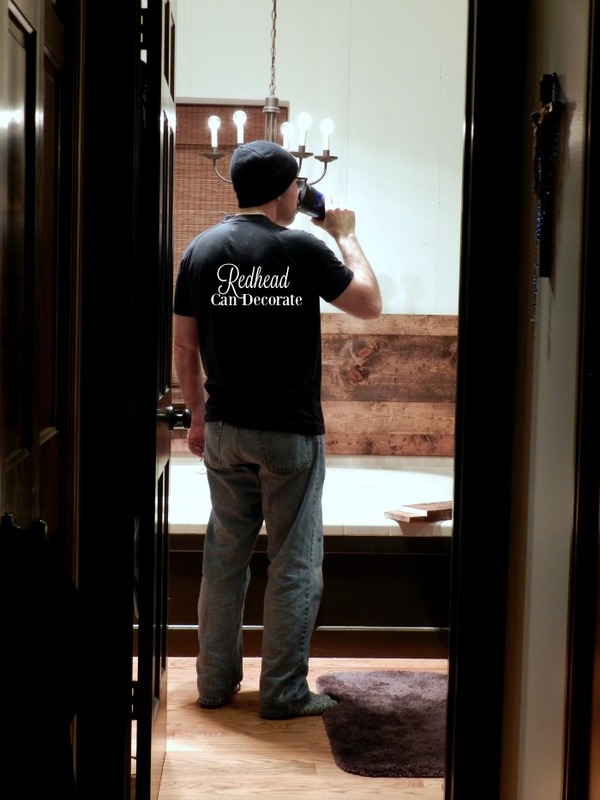 I love both, your bed and bathroom. Beautiful results. Hi Ivory! Happy November to you my friend! Can’t wait to share some holiday ideas with you!! 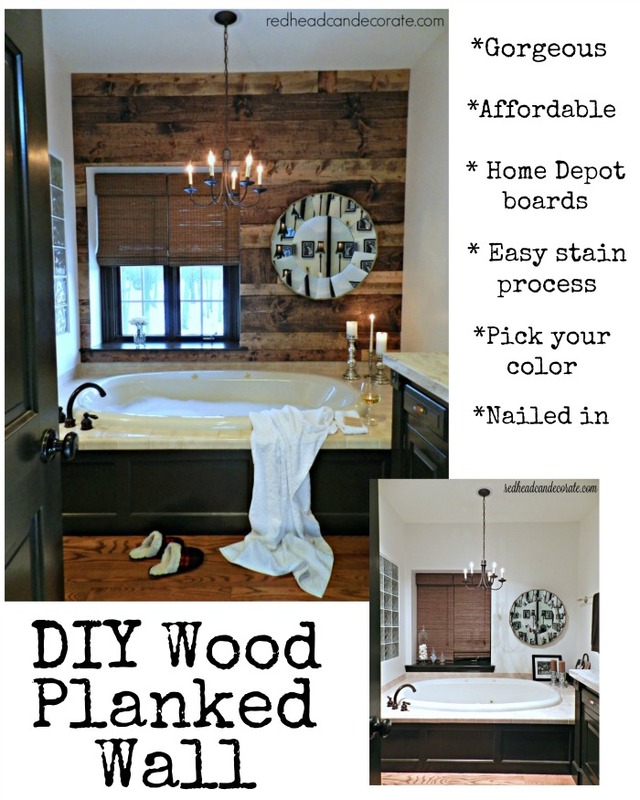 What stain color do you use new the planked wall? Love the warm brown and can’t figure it out. Thank you! !